- Towers point is back but now decreased to 3 points only. - Smart host choice: Always when a MN member is on the game, he will be the host, independently of his slot. Otherwise, the host will be the red player. - Nidaime Mizukage R now slows and is faster. - Hashirama R now stuns again but it was reduced from 2s to 1s and damage decreased. - Deidara E in Flying Mode now stuns again but his creeps do not give map vision anymore. - Killer Bee Q and W "fixed"
An AoS map stylized on Naruto Universe. 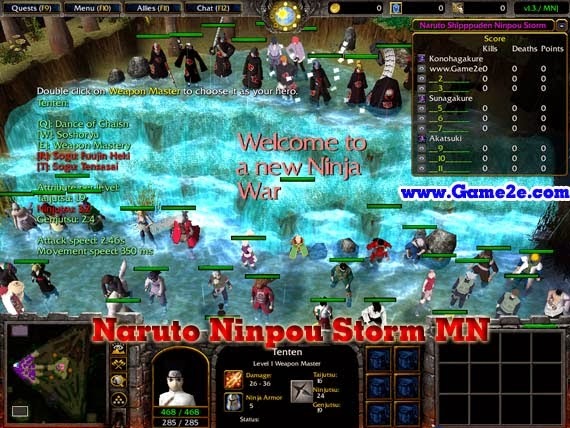 Pick your hero and fight for your village in a New Ninja War!